Up to this point, I have simply been using some 1.5 mm MLD Liteline on all of my tie outs on this tarp. This has worked great and has not been any problem at all. However, now with the thought of using this tarp over a hammock, I wanted to be able to have a little more control in positioning the actual tarp over my hammock, without untying and retying all the guylines, or at least along the ridgelines. So, when I placed my order with Whoopie Slings, I added a Single Line Tarp Ridge Line to my cart. This tarp ridge line really helps to take all of the guess-work out of getting the tarp positioned right. 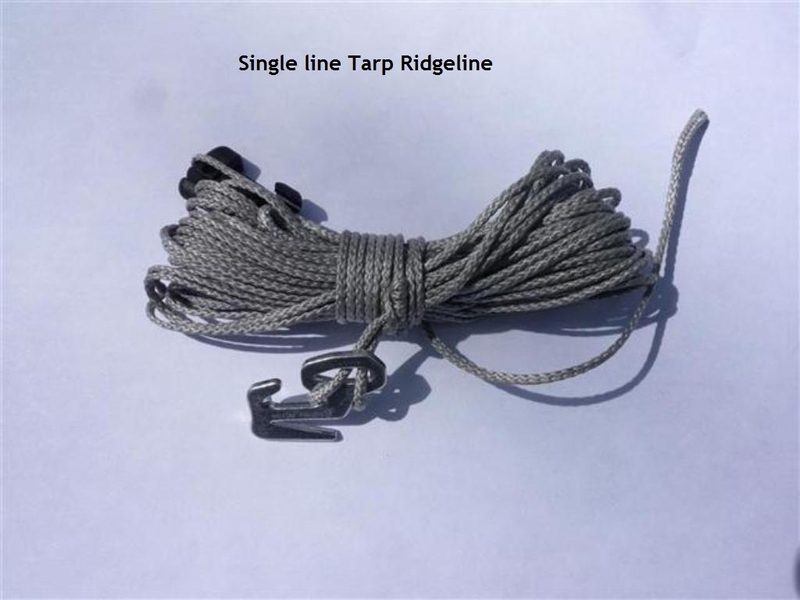 The tarp ridge line is a 30 ft line that has a Knot Bone secured in one end which just so happens to be a very quick and easy item to use to secure one end of the ridge line. On the opposite end of the ridge line is a Nite Ize Figure 9 attached to a Prusik knot which makes cinching the ridge line down good and tight a cinch (quite literally) . But the real magic of this Whoopie Slings Single Line Tarp Ridge Line is the 2 items found between the Knot Bone and the Figure 9. This is also where Stu really showed up for me in my order. This line comes standard with 2 regular Prusik knots in the middle of the line, however, for just a few dollars more, these can be swapped out for the Soft Shackle Prusik’s. These are essentially tiny little Whoopie Slings which can be opened and then locked around a tiny knot, hence, the term “shackle.” This is a great way to connect a tarp to the tarp ridge line, however, when I placed my order, I failed to realize this. The next morning when I did realize this, I quickly emailed Stu and asked if I could change my order. Just a few hours later, Stu returned the email informing me that the change has been made and we were all square!